Du er det dyreste i verden. mine skuldre, mine hender og mitt hjerte. Friheten er ditt vakre navn. Vennskapet er din stolte søster. din far er kampen, fremtiden ditt ansvar. 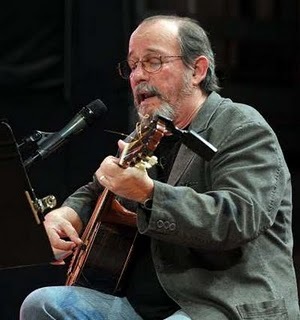 Silvio Rodríguez Domínguez (born November 29, 1946 in San Antonio de los Baños) is a Cuban musician, and a leader of the nueva trova movement. He is considered Cuba's best known folk singer and known for his highly eloquent and symbolic lyrics. Many of his songs have become classics in Latin American music, such as Ojalá, Playa Girón, Unicornio and La maza. Rodríguez, musically and politically, is a symbol of the Latin American left wing. Several of his songs praise the revolutionary figure Che Guevara and he is also currently deputy in the Cuban parliament. His lyrics are notably introspective. His songs combine romanticism, love (even eroticism), revolutionary politics, and idealism. He has released nearly 20 albums. The name of this song is in Cuban: "El día feliz que está llegando" or english: "Song to freedom"